A recent video I saw comparing various quality violins triggered this post because the comparison took place in the school and store of Peter Prier & Sons Violins in Salt Lake City. (The last name is pronounced rhyming with “freer” not with “fryer.”) Many years ago, 11 years to be exact, I visited the school and the store and spent about an hour with the master luthier Peter Prier himself. I made a book at the time and shared a copy with him but never wrote a post and shared the photographs I took until now. That video told me it was about time I wrote about the man, his work, and our experience there. During one of our visits to Salt Lake City in 2006, Elif talked about a very interesting violin making school she had found and later took us there. 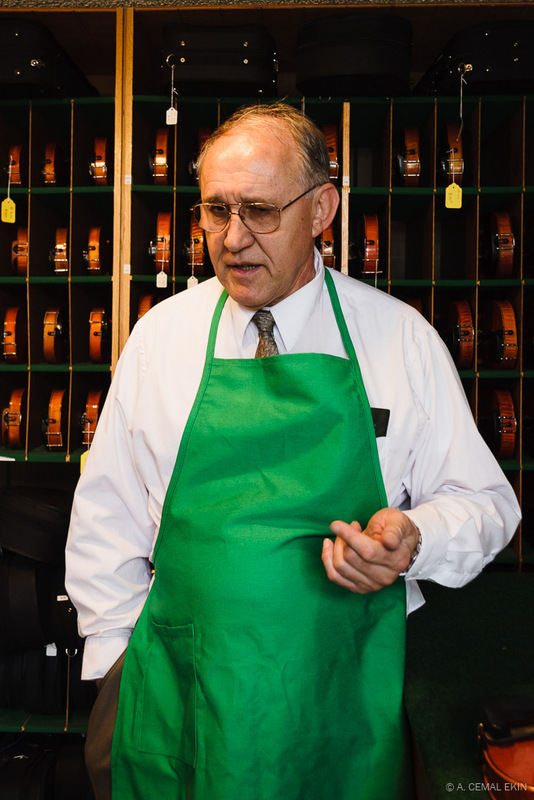 Peter Prier & Sons Violins, Violin Making School of America is a little gem in Salt Lake City. It attracts students from different corners of the world who attend the school to learn the art and craft of making fine violins and other similar instruments. Located in an unassuming building near downtown Salt Lake City, the school and the store operate side by side. The instructors and students were kind enough to allow me to photograph while they practiced and honed their craft. A process that takes years to master and at least months to produce a single instrument clearly requires a great deal of skill, patience, and love of the instrument and music. I enjoyed watching them lovingly scrape the wood, shape the edges, and pass their hands over the delicate wood as if to caress its skin even more than I enjoyed photographing them. Their engagement with their work was intense, their touch caring, and their look was full of pride. As we entered the small shop next door and started looking around a guy in a white shirt and tie with a green apron asked us if he could help us in a slightly annoyed tone. Elif told him that she brought her parents to see this interesting place and could her father take some photographs. Mr. Prier asked why I wanted to take photographs and I told him that I did this as a personal hobby and project to assure him I was not a journalist. He agreed that we could quickly look around and take a few photographs. 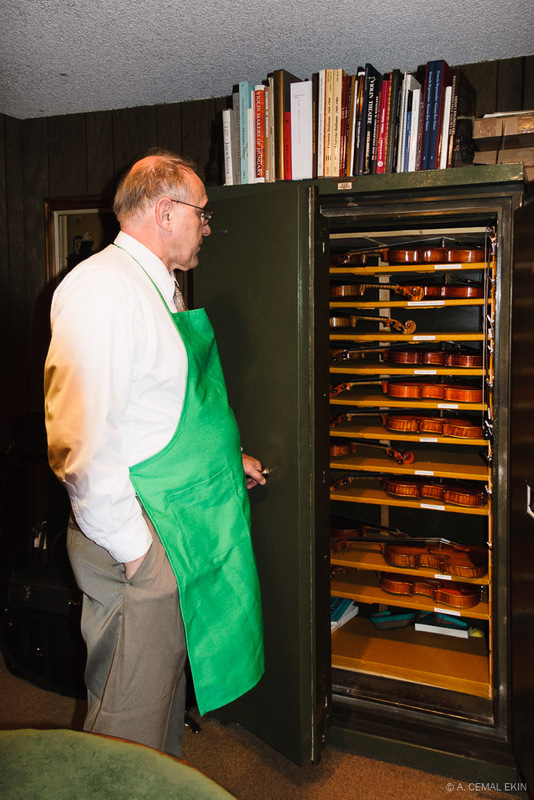 The meeting that started on a tense note quickly changed once he realized that we were genuinely interested in his work, his school of violin making, and he started talking and explaining a myriad of things to us. As he spoke in the front room with a good collection of violins in their individual compartments, on the tables, hanging on the walls he would grab one and tell us some unique things about that instrument. He then showed us to the next room behind where there were more of the same, and eventually, we were taken to the long room in the far back with many violins, cellos, and other instruments on the walls and on the floor. There, Peter Prier took different violins from the wall and started playing for us to show their unique qualities and seemed to enjoy doing that as much as we enjoyed listening to him. On the way back, in the middle room I believe, he opened a very large vault storing highly valuable violins and other related items. One bow he pulled out and showed to us with a very gentle gesture of laying the end of the bow in his hand was worth $40,000! Yes, forty-thousand dollars. Some of the violins he pulled out dated back to the 17th century and were valued at hundreds of thousand dollars. We very carefully watched him as he showed us his prized collection. All told, the visit that started with a terse greeting lasted much longer than we all anticipated and Peter Prier showed us great hospitality and showered us with information, showed us fine instruments, and most of all, he showed us how much in love he was with his art and craft. He was a very decent individual, and it was a pleasure to spend over an hour with this man who, deep down inside, seemed to be a humble person. About 10 years later, I met a violin maker in Rhode Island who specializes in photographing violins. Tucker Densley’s photographs were published in a huge volume, The American Violin, containing images he photographed at museums or private collections. As he showed the beautifully photographed and printed book, I mentioned to him that he was the second violin maker I met and told him of Peter Prier. He smiled and excitedly told me that he went to Prier School of violin making! Small world! Peter Prier died a couple of years ago. Somehow, Elif connected with his daughter and I was able to share the photographs with her. Now, 11 years later, I can share them with you all. Peter Prier’i saygı ve sevgiyle anıyoruz..
Suphesiz cok ilginc bir adamdi.